CCIE Routing and Switching v4.0 Configuration Practice Labs presents you with three full configuration lab scenarios in exam style format to echo the real CCIE Routing and Switching v4.0 lab exam. This publication gives you the opportunity to put into practice your own extensive theoretical knowledge of subjects to find out how they interact with each other on a larger complex scale. An “Ask the Proctor” section list of questions for each section helps provide clarity and maintain direction to ensure that you do not give up and check the answers directly if you find a task too challenging. After each lab, this eBook lets you compare configurations and routing tables with the required answers. You also can run through a lab de-brief, view configurations, and cut and paste configs into your own lab equipment for testing and verification. The point scoring for each question lets you know whether you passed or failed each lab. This extensive set of practice labs that sell for hundreds of dollars elsewhere helps you make sure you are fully prepared for the grueling CCIE lab exam experience. can this be opened back up – I just refilled my prepaid card. Lol. As you can see I need the cert. 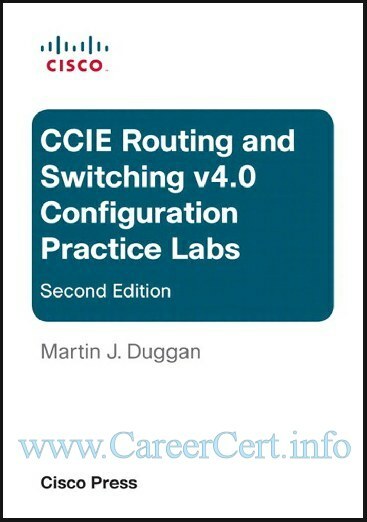 CCIE Routing and Switching v4.0 Configuration Practice Labs (ebook), 2nd Edition” and want to buy but seeing now that its closed, please how could i be helped? the configuration provided is correct or its need some rectification because CCIE Cert R&S V4 some configuration is wrong. This book is published by Cisco itself. So there is hardly any chance of configuration mistake. Thanks, i purchased this, it’s another one I can practice. Aslo, can you please check Cisco 360 Learning Program for CCIE R&S – Lesson Troubleshooting Block1 Part 6, it can’t be downloaded from 4shared. any one have r&s lab mettrial. I’m looking for the CCIECERT R&S V.4 book .. would it be available as a group buy? .. i saw ur reply to Pawan but i guess they are still the best in the market so far ..
you have to build the topology for labs# 1 and 3. Lab#2 can be practiced on cisco 360 topology. Sorry, i can't provide cciecert lab. I've lost my faith in ccie lab vendors. It's hard to trust anyone for ccie lab. It would be better to use the official material. Can the 3 labs included in this book be practiced on CISCO 360 topology or we have to build the topology with our own equipment ? Nope, pass4sure practice labs are useless. You should never buy them. Hi CareerCert, will the pass4sure practice lab be available as a group buy? yah, i forgot to mention that the initial configurations for all 3 labs are also included with this book. I got them as a bonus download after registering the product. Just contributed. I was surprised to see the bonus material. thanks. Thankssss a lot man. I was really looking for it. Now i can print and study this book easily.